What exactly is the ‘other’ section in your phone’s storage space for? It has a purpose, honest. WHEN YOU CHECK up your storage space on your phone, tablet, or computer, it’s normally broken up into different sections. You have your apps (are the bread and butter of your phone), images and video, audio, cached data (temporary data from a website or app designed to make them load up faster) and the ‘other’ file. On iOS, you can see this anytime you connect your phone up to iTunes while Android users can see it in usage settings. But if you’re wondering what exactly is hidden here, or why it’s not given its own section, it’s everything that doesn’t quite fit into the above categories. You will have things like downloaded data from apps, your browser cache (on iOS), files downloaded from the web, notes, memos, backup files included here. Normally these files are so small that having separate entries for them would be pointless as it would make the menu much longer than it should be. But if it is higher than normal, how can you clear it? Well, if you’re on iOS, the best way is to go into storage and apps themselves. For example, if you go into Chrome, Safari or WhatsApp, you will be able to delete documents and data there, or clear your cache. The same thing can be done on Android by going into Settings > Apps and the app in question. Tapping on Storage will open up options to clear cache or clear data entirely. The other thing to note here is if you’re using Android and you’re looking at your storage overview, the Explore section is here as well. This allows you to delve deeper into your phone and explore the different files here, and you might find some files you didn’t realise were saved. Email “What exactly is the ‘other’ section in your phone’s storage space for?”. 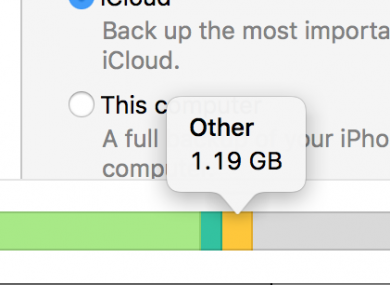 Feedback on “What exactly is the ‘other’ section in your phone’s storage space for?”.